If you are interested in iRobot's floor mopping robots, there is a good chance that you're already equipped with an iRobot Roomba vacuuming robot you're in love with, and you're now ready to own also a floor mopping robot to eliminate one of the least pleasant chores one has to endure every week to keep the floors clean. 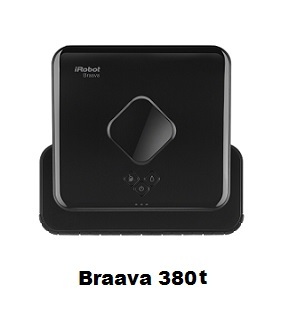 iRobot currently makes two different brands of floor mopping robots: Braava 380t and Braava Jet 240. There are some differences in the way the two Braava robots mop the floors and these will be detailed below in this article. But it is already worth mentioning that both Braava robots mop the floors with an attached wet, damp or dry microfiber cloth or a special pad. Note that Braava was originally owned by Evolutions Robotics which was purchased in 2012 by iRobot. This article will describe and compare the Braava 380t and Braava Jet 240 floor mopping robots. Otherwise continue below with the comparison of the three selected robots. Both Braava robots are rectangular. Braava 380t measures 8.6"x 9.4" with a height of 3.1". Braava Jet 240 measures 6.7” x 7” with a height of 3.3”. Braava Jet 240 weighs 2.7 lbs. Braava 380t comes in black while Braava Jet 240 comes in white. So, Braava Jet 240 is smaller and lighter than Braava 380t. Smaller size is an advantage when considering floor vacuuming or floor mopping robots, because it allows the robot to access narrower spaces and mop under lower furniture. Braava 380t does not pour any liquid on the floor, but it mops the floor using either a dry or damp microfiber cleaning cloth which picks up the dirt, hair and dust. For dry mopping, the robot moves in straight lines, and for damp mopping, it moves back and forth to efficiently and thoroughly mop the floor. All one needs to do is attach a cleaning cloth to the removable magnetic cleaning pad, place the robot down and press either the sweep button for dry mopping or the mop button for damp mopping. With Braava 380t, when damp mopping is selected, the built-in Pro-Clean reservoir pad dispenses cleaning water throughout the cleaning cycle to keep the cloth damp (of course, the Pro-Clean reservoir pad must be filled with water before use). Note also that Braava 380t comes with a Turbo Charge Cradle which is a one-stop charging and storage space. It can charge the robot in as little as two hours. Braava Jet 240 is quite a bit different. It was designed to sweep and mop smaller floor areas and in particular kitchens and bathroom. Because of its smaller size, the robot can get into hard to reach areas such as around toilets, below cabinets and into corners. It can be used to wet mop, damp sweep or dry sweep hard floors whether tile, wood or stone. So it can be used not just in kitchens and bathrooms, but in rooms with wood or laminate floors as well. Note that for larger rooms more than one battery charge may be required. What is special with Braava Jet 240 is that it automatically selects the type of cleaning method to be used based on the pad type installed. Three types of pads are available (one for each of the three cleaning methods it can perform): wet mopping pads, damp sweeping pads and dry sweeping pads. The pads are disposable and premixed with detergent. Note also that Braava Jet 240 is equipped with a precision water nozzle that sprays liquid on the floor to loosen dirt and stains (the robot is able to locate obstacles before it sprays the liquid to protect furniture, rugs and walls). This feature is activated only during damp or wet cleaning and requires that you fill the reservoir with water before activating the robot. The robot is also equipped with a vibrating cleaning head that gently scrubs the dirt and stains to remove them. Finally, to recharge the removable and rechargeable battery, you just need to place it into the provided charger and plug the charger to a wall socket. Braava 380t: 1000 sq-ft with dry mopping and 350 sq-ft with damp mopping. Braava Jet 240: From 150 sq-ft to 200 sq-ft.
Braava 380t uses a standalone battery-run Cube to enable the robot to determine its location in the room and to build a map of its route for efficient cleaning. The Cube is placed anywhere in the room to be cleaned and projects a signal to the ceiling that the robot uses to determine its location. It really works like an indoor GPS that helps the robot to keep track of where it is and where it needs to go. The robot makes a single pass over each area within its configured map, and once the work is completed, it returns to its starting point. Note that Braava 380t can operate with more than one Cube. If you have more than one room to clean, you simply place a Cube in the first room that needs to be cleaned and place additional Cubes in other adjacent rooms or areas you would like the robot to reach. Braava will automatically clean from one Cube to another. 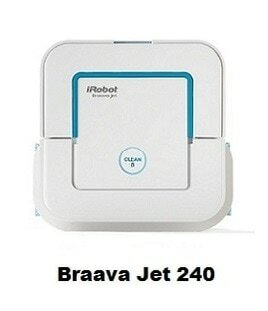 Braava Jet 240 does not require a Cube to operate and, very much like the Roomba vacuuming robots, uses the iRobot iAdapt navigation technology which is an advanced system of software and sensors that enables the robot to avoid falling down stairs and riding up on rugs as well as remember obstacles in its path to slow down and gently clean along furniture and walls. Because the Cube based navigation of Braava 380t uses a map, you can be sure that all of the floor surface in the room where the Cube is placed will be covered, but since this robot doesn't pour water on the floor and doesn't scrub, it is more suited to floors that don't get too dirty and don't have hardened tough spots. On the other hand, since the iAdapt Navigation used by Braava Jet 240 does not build a map, and rely on sensors to detect dirt, the robot may not cover certain areas of the floor that are not very dirty. But because it does multiple passes, pours water on the floor and is equipped with a vibrating cleaning head that gently scrubs the dirt and stains to remove them, it can better get rid of spots that are tougher to clean. Note also that both Braava robots are rectangular in shape which allows them to clean better wall edges and corners. Both robots are also capable of avoiding stairs, area rugs and raised transitions to carpets. ​With Braava 380t the mopping is confined to the room where the Cube is placed. On the other hand, because Braava Jet 240 uses the iAdapt technology, it could move from one room to another if there is no obstacle between the rooms. In order to avoid that when it is not needed, the robot allows you to create an invisible boundary that is not to be crossed by invoking its own special “Virtual Wall Mode”. Note that this is different from the Roomba Virtual Wall functionality which requires usage of a hard Virtual Wall unit. With Braava Jet 240, no hard Virtual Wall units are used. You create a virtual boundary yourself by placing the robot on one side of a line you don't want crossed and holding the start button. This is very useful if you want to keep the robot in rooms without a door such as kitchens and entryways. The Braava 380t Cube is shown below. Note that though a cube is included in the purchased of Braava 380t, additional units can be purchased separately on Amazon. Both Braava robots are practically quiet. There is simply no noise you can hear! You can even run them at night without fear of waking up your neighbors. After use Braava robots require little maintenance. Simply remove the wet wipe or pad and clean it if it is reusable. Braava 380t: 1-year limited warranty for robot and battery. Braava Jet 240: 1-year limited warranty for robot and 6-months on the battery. Please click the robot of your choice below for price information or to purchase. ​Have you not found the product you were looking for?